Your life purpose calls you for more. Finding your life purpose is one of the most important things you can do to live a fulfilling and happy life. Finding your purpose can also be a challenge. Often it isn’t clear what physical steps you can actually take to help you find your purpose. Luckily, I don't think life should be spent finding your purpose, it should be spent living it, so I created a system to help you take actionable steps to find your life purpose, (I call it your superpower), as fast as possible. So if you have been struggling to find your purpose, or if you have been searching for how to find your purpose and passion in life, then you have come to the right place. Our purpose is an expression of the deepest dimension within us – of our central core or essence, when we have a profound sense of who we are, where we came from, and where we’re going. (pp. ix-x). As Leider puts it, your life purpose is the expression of what is at the core of you. Your life purpose is not something set out for you by others. Your life purpose is not something that you find outside of you. Your life purpose is found by turning inward to find your deepest gifts, and then going out into the world and using them. I like to call this deepest part of you your superpower. Your superpower is the thing that is irrevocably you. It is the one thing that you do like no one else, and the one thing you enjoy more than anything else because it uses your most essential self. How do you find your purpose (your superpower)? I searched for my purpose for a long time, 20 years in fact! I read books, I attended workshops, I got coaching from some of the best life coaches in the world, all in the hunt to find out what is my purpose and why am I here. It was only when I turned inwards to find out more about myself that I was finally able to answer, “what is my life purpose?”, and that answer was my superpower! So to find your life purpose, you just have to find your superpower! and what you bring to the world in your interactions with it (your social currency). These three things are at the core of who you are, and finding them lets you figure out your superpower, the purest form of your life purpose. This guide will tell you how to find the different pieces that make up your superpower, and then how to pull it all together into your superpower! The Superpower Model (click to enlarge). I also created a life purpose worksheet called the Superpower Model to help you keep track of the parts of your superpower. and each of the steps in this guide broken down over the course of 14 days, making it easier than ever to find your life purpose. The first step to finding your superpower is below! Make finding your life purpose easy with the superpower model worksheet and emails breaking down each step in this guide! You are on your way to finding your life purpose! The first part in finding your life purpose, your superpower, is understanding what you care about most. The way you find this out about yourself is by finding your core values! Your values represent what you care most deeply about. When you know your most important values, you know the bedrock of who you are. Your life purpose, your highest calling, your superpower - for them to be truly and authentically yours - must line up with what is at the core of you. Because knowing your top 5 core values is the first and most important step for discovering your purpose and your superpower, I created a definitive guide on finding your values. You can check that out here. You can also get a digital version of the Tomi Llama Values Cards to help you find your values by entering your email above (where you can get the superpower worksheet) or at the bottom of this page! Once you know your core values, you can add them to your superpower model and move to step two. The second part of finding your life purpose is finding what you are best at, i.e. your strengths! This question can be hard to answer, but it is important. Your top strengths are the things that you are best at. These are the gifts you bring to the party! These strengths, like your core values, play an important role in finding your superpower and finding your purpose, and to live your best life you really have to own them. Finding your top 5 strengths might be the easiest part of the Superpower Model because someone else is going to tell you what they are. All you have to do is take a simple assessment. I recommend one of two assessments: the Clifton StrengthsFinder Assessment (paid) and the High5 Test (free). Either one is good, and they are both available online. The StrengthsFinder test will send you a report, but the High5 test will not (unless you pay for the report), so make sure to take a screenshot of your strengths and the definitions so you have them for your own notes and for the worksheet. Discovering your top 5 strengths can offer you important insights into your behavior. Someone once advised me to try reading a book for fun. I wasn’t sure I knew how to do that; I was driven to learn more, to know more, to understand more. Some days I just didn’t understand the burning desire that fueled my educational pursuits. It took completing the Clifton StrengthsFinder Assessment and discovering that my number 1 strength is learner to make me realize that learning is a natural part of who I am and what I do. It also put into perspective the fact that I am always reading for fun, even when my consuming multiple books at a time might look like work to others. My son Warren loves to get on the telephone with me to talk ideas and think about new ways to proceed on projects. When he took the High5 Test, it revealed he is a brainstormer. Of course he is! For you, finding your top strengths might help you understand better why you do what you do! Isn’t that beautiful! I love the understanding and deeper sense self that comes from knowing these parts of you. Your strengths might be tied to what you love to do, or how you think things should be done. Your strengths might drive what you are passionate about. However they show up though, your strengths play a critical role in figuring out your superpower. Once you have your top 5 strengths, place them in the appropriate section on your superpower model, just below your top 5 values, and you will be one step closer to your life purpose! The next step in discovering your superpower and discovering your purpose lies in understanding what you offer the world. I call this step finding your social currencies. Your social currencies are what you bring to the table when you interact with the world. Your social currencies are the gifts others receive from interacting with you. Your social currencies are how you make other people’s lives better and happier. For example, one of my social currencies is to bring wit, wisdom, and humor to each interaction. This means whenever you interact with me, I am going to try to make you laugh and maybe sprinkle some profound knowledge in there along the way! The first way you can find your social currencies is to read the descriptions of your values and strengths. If that happens, you may have found a social currency! One of his top strengths from the High5 test is self-believer. That is exactly how he likes to show up in the world, and that calming presence is one of his social currencies! Another way to find your social currency is to think about why people seek you out. Do you find yourself being the “go to” person for something specific? Maybe people come to you because you know how to handle high-pressure situations. Maybe people come to you because you are highly organized and are great at helping others get organized. If you can think of something like this in your life, you might have found another one of your social currencies! Another way to understand your social currencies is to look at the intersection of your values and strengths. Want me to talk you through finding your superpower and life purpose? Click here! Another one of my social currencies is making complex things seem simpler. I am good at taking abstract concepts and making them easier to understand. From my strength of learner, I am good at taking in lots of knowledge. From my values of wisdom and effectiveness, I am good at taking that knowledge and making it more understandable! My values and strengths work together to form that social currency. The same is true for you. Your strengths and values interact in unique ways that make others' lives better! Finding your social currencies may seem complicated, but it doesn’t have to be. Just think about how you like to show up in the world. Usually the reason you like to show up this way comes from you having a certain value or a certain strength. Just like with your values, finding your social currencies can take some digging, but it offers a profound understanding of what you bring to the world, which is key to finding your superpower! Your superpower is what you bring to the world that no one else can. Your social currencies are what you offer the world based on your strengths and values. Now you just have to boil them down even more to get your superpower! Your Superpower is where you bring it all together. Your values, strengths, and social currencies all intersect to create the one thing you do like nobody else: your Superpower. 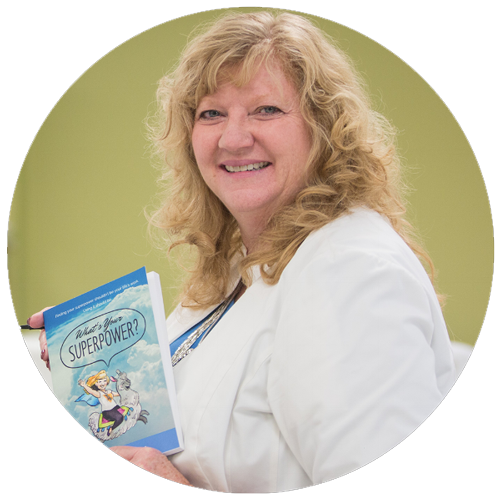 Your superpower lies at the heart of everything on your Superpower Model, and now you just have to sift through what you have found out about yourself to figure it out! My superpower is "Connecting unseen or hidden patterns to facilitate personal transformation." It is short and simple, and is the sweet spot right in the middle of all that I am and what I love to do. My superpower draws heavily on my values, strengths, and social currencies. Using one of my strengths, strategic, I can spot relevant patterns and issues. Then, I use my social currency of simplifying the complex to help someone simplify that pattern or issue. Lastly, I value effectiveness, meaning I help people work through these things as fast as possible to transform in unique ways! As you can see, my superpower doesn’t use all of the parts of the Superpower Model. That’s fine! Your superpower might not tie in every part of the different pieces of you, and that is okay. This process of finding the different parts of you - your values, strengths, and social currencies - gives you more awareness about yourself. Discovering your superpower then becomes about sorting through these pieces and discerning what you care most deeply about and what you are best at. The same is true of your Superpower. No one has the same combination of experiences, values, strengths, and social currencies as you. Once you have found your superpower, you will have gained significant insight on how to find your purpose and passion in life: just use your superpower! Your next step is to pick the direction that aligns with your superpower and to go out and use it! Use your superpower take your life to new heights. There are infinite life purposes out there, and you can find your specific life purpose by finding your superpower! The purpose of discovering your superpower isn’t just to know it. It is to use it to create the most incredible, fun, purposeful, and authentic life you possibly can. So pick a direction that aligns with these deepest and truest parts of who you are and move in that direction each day. If you want some more advice on how to do that, you can check out Grow Yourself in the superpower system. You can also get my book, What’s Your Superpower?, to get the full story and even more life-changing tips. P.S. I’d love to know… what is your purpose in life? Comment with your superpower and how you are going to use it below!